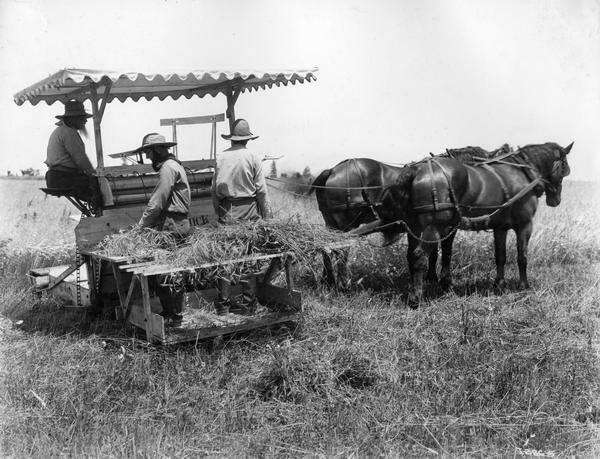 Men demonstrating the horse-drawn McCormick "Marsh type" harvester built ca. 1878. The men are wearing period dress and the photograph was most likely staged as a historical re-enactment - possibly in conjunction with International Harvester's "reaper centennial" celebration. Original caption reads: "This type of machine was built in McCormick's Reaper Works in Chicago from 1875-1883. An elevator delivered the cut grain to a platform on the side of the machine where it was bound into bundles by hand. Two men could bind the grain as fast as it as cut. With the reapers fo earlier years, a crew of 4 or 5 men was required to do the binding."